The Ultimate Luther Vandross In Stores 8/22, Buy It Now! The Ultimate Luther Vandross is a career-spanning collection of 18 songs from Luther’s J Records and Epic records releases. The record includes all of Luther’s infamous hits, as well as the previously unreleased tracks, “Got You Home,” and “Shine” (produced by Jimmy Jam & Terry Lewis). The Ultimate Luther Vandross hits stores August 22nd! 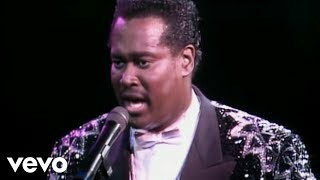 The Ultimate Luther Vandross features all of Luther’s chart topping singles including “Dance With My Father,” “Here And Now” and “Endless Love,” Luther’s 1994 million-selling duet with Mariah Carey. The album also reprises such Vandross classics as “A House Is Not A Home,” “Wait For Love” and “Superstar/Until You Come Back To Me” alongside key album cuts such as Luther’s 2003 duet with Beyonce, the cover of the Roberta Flack/Donny Hathaway classic “The Closer I Get To You,” “Buy Me A Rose” and “Think About You,” all taken from Luther’s last studio album.